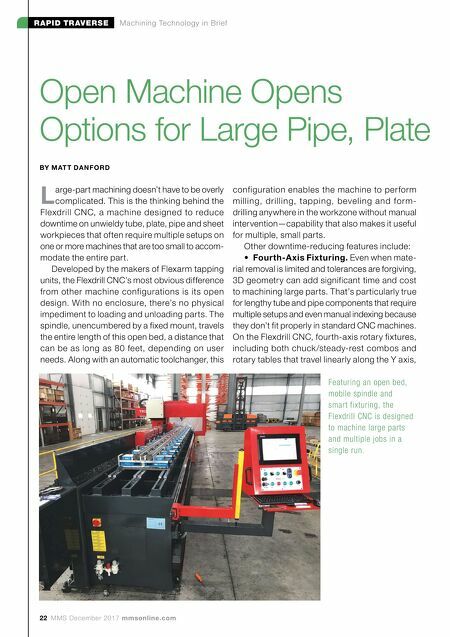 22 MMS December 2017 mmsonline.com RAPID TRAVERSE Machining Technology in Brief Open Machine Opens Options for Large Pipe, Plate BY M AT T DA N FO R D L arge-part machining doesn't have to be overly complicated. This is the thinking behind the Flexdrill CNC, a machine designed to reduce downtime on unwieldy tube, plate, pipe and sheet workpieces that often require multiple setups on one or more machines that are too small to accom- modate the entire part. Developed by the makers of Flexarm tapping units, the Flexdrill CNC's most obvious difference from other machine configurations is its open design. With no enclosure, there's no physical impediment to loading and unloading parts. The spindle, unencumbered by a fixed mount, travels the entire length of this open bed, a distance that can be as long as 80 feet, depending on user needs. Along with an automatic toolchanger, this configuration enables the machine to perform milling, drilling, tapping, beveling and form- drilling anywhere in the workzone without manual intervention—capability that also makes it useful for multiple, small parts. Other downtime-reducing features include: • Fourth-Axis Fixturing. Even when mate- rial removal is limited and tolerances are forgiving, 3D geometry can add significant time and cost to machining large parts. That's particularly true for lengthy tube and pipe components that require multiple setups and even manual indexing because they don't fit properly in standard CNC machines. 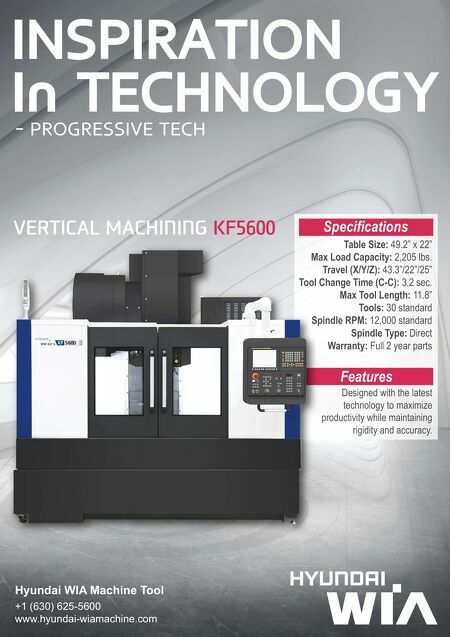 On the Flexdrill CNC, fourth-axis rotary fixtures, including both chuck /steady-rest combos and rotary tables that travel linearly along the Y axis, Featuring an open bed, mobile spindle and smart fixturing, the Flexdrill CNC is designed to machine large parts and multiple jobs in a single run.